I found out that my kids eat veggies more easily sometimes when they are simply mashed... 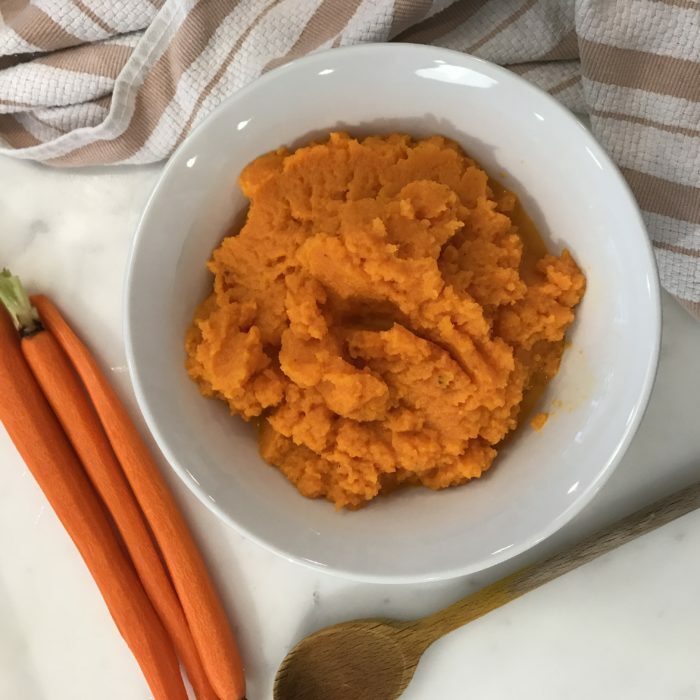 I go many different ways with mashed veggies and love to experiment, here is a classic that goes well with a lot of dishes! Sauté the shallot with 1 tbsp of olive oil for a couple of minutes, add the carrots and cover with the water. Bring to a boil, reduce to medium low and cover. Cook for 5-7 minutes until carrots are soft. Keep the cooking liquid. Transfer the carrots to food processor and add a couple of tbsp of the cooking liquid, the butter, 1/4 tsp of salt and a few pinches of pepper. Pulse until smooth, you may need to add more water depending on the consistency you are looking for!